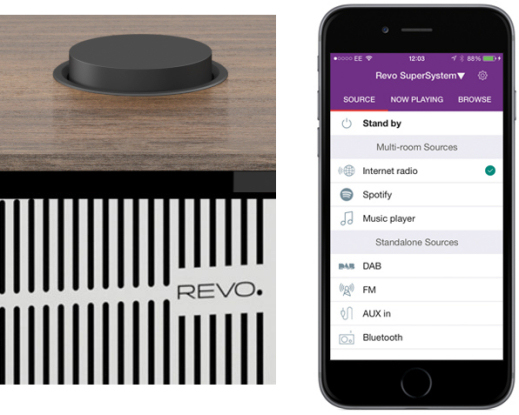 Revo have built a reputation for quality, British-designed music systems focussing on internet radio and DAB+. Their flagship SuperSystem brings together Bluetooth aptX and network audio features for high-end music streaming from smartphones and home networks. CD-quality streaming is provided by wireless, Bluetooth aptX technology, while music can also be played wirelessly from DNLA-compatible network-attached storage. An app - Undok - available on Google Play for Android and iTunes for iOS, lets you create a wireless multiroom system and brings together control of SuperSystem’s various functions including DAB, FM, internet radio, Spotify Connect, Network Audio and USB audio playback. Music played via Bluetooth and through the 3.5mm audio input can also be distributed across a multiroom network using the app. Soundwise, the SuperSystem impresses with an 80 Watt Class-D amplifier, twin 3.5 inch BMR flat diaphragm speaker drivers and a separate, ported 40 Watt subwoofer - no niggly mono output here! There are ten individually-labelled presets along the front of the busy button panel (which means no searching through menus to access your favourite DAB, FM and internet radio stations), above a clear, very readable 2.7 inch OLED display. There's even a ethernet jack for wired connections to your home network, in addition to a built-in wireless aerial. A mini joystick and select button sit to the right of the display, for scrolling through stations and selecting music tracks, for example. A USB port charges your 'phone, while also providing another means of playback - via a USB memory stick filled with tracks in any of AAC, AAC+, MP3, WAV, WMA and FLAC format. The radio will also handle internet radio stations broadcasting in these formats, including live radio and talk podcasts from the BBC. 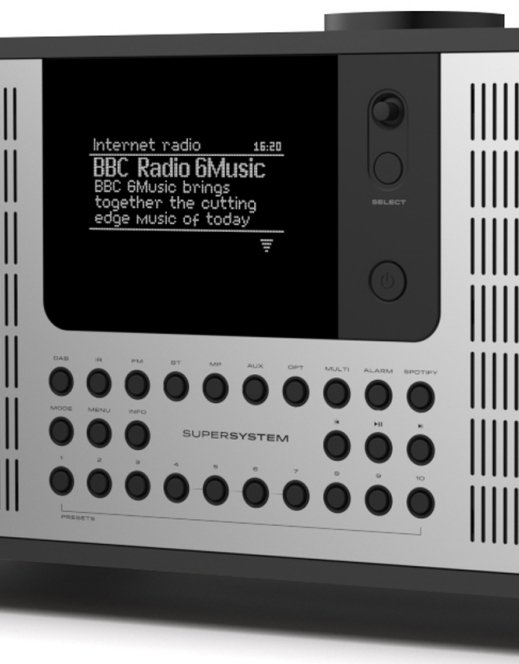 Both DAB and DAB+ are catered for by the digital tuner, which gives the SuperSystem futureproofing and earns it a 'digital tick'. These type of systems tend to be used in the bedroom or living room - if it's the former you're thinking about, the Revo also has alarm clock functionality with two separate alarms and programmable sleep (15, 30, 45 or 60 minutes) and snooze features (up to 30 minutes via button presses giving 5, 10, 15 or 30 minutes' duration). The OLED display can be set to off, low, medium and high brightness settings when in standby and in-use modes, which means it won't light up the room at night, but can be set to a brighter readability setting during the day. A headphone socket and remote control are also provided. Hard-wired connectivity is provided by 3.5mm headphone, digital optical-out, wired LAN, software update port, AUX-IN and stereo RCA out sockets. If you fancy one for abroad, the audio system is also supplied with a multi-country power supply (UK, Euro, USA & Australasia), is w43 cm x d22 cm x h16.5 cm and weighs in at a convincing 9.8 kg. The SuperSystem is an incredibly smart, well thought-out system offering Spotify Connect functionality and thousands of internet radio stations at your fingertips. A well-designed panel offers direct access to all sources and favourite stations, while Bluetooth and network audio capabilities mean that all audio bases are covered. The Revo SuperSystem is available at £549.95 - check below to find out where to get one. You can get the SuperSystem from John Lewis at around £550. Amazon also sell the SuperSystem.